Sue took her ICC volleyball team to the National JUCO Division II tournament at Owens, Ohio, where her women brought home a 5th place trophy to cap a 38-7 season. It is appropriate that this prestigious award named for Neve Harms be awarded this year to co-winner Walter Eisele, as Walt was one of the original members of the Proctor Recreation Comet Club, a youth group founded by Neve Harms in 1935. A retired electrician, Walt has been involved with youth-oriented organizations for over 50 years, either by spearheading fundraisers for youth programs or by co-ordinating youth sports activities. A graduate of Manual where he lettered in football, Walt has always been a "doer" - whatever the job, big or small, he does it!! He has been a long-time member, former Board Member and Past President of the Independent Sports Club; he has also been active in the Old Timers Baseball Association, serving on their Board of Directors for several years. 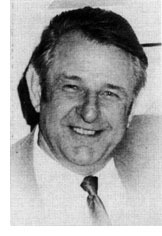 A charter Board member and co-founder of the Spalding Booster Club, he was named "Spalding Booster of the Year" in 1966-67 for his many years of service to that group. For his outstanding and dedicated service to Carver Center, he was honored by their Board of Directors. His volunteer efforts also involve the "Meals on Wheels" program. Walt is currently President of the "Friends of Fatherless Boys and Girls," a group that he helped form over 20 years ago. This is probably his favorite youth program, as he has been a Board Member since its beginning. An avid sports fan, Walt's retirement years have been occupied with golf, bowling, and fishing. Although Walt and Gert, his wife of 47 years, travel extensively, he still finds time for his two daughters and threee grandchildren. It is a bit ironic that he met Gert on the tennis courts of Proctor Center. One of Walt's first jobs was as a life guard at Proctor Center. Who gave him that job - none other than Neve Harms himself!!"